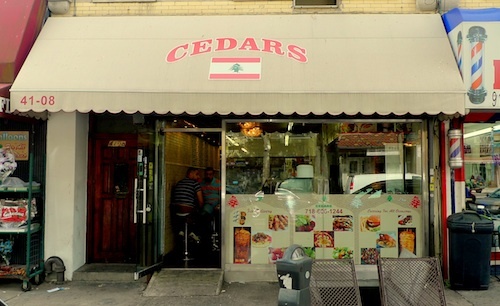 For a good portion of the halal eating community of Astoria, Cedars seems like a hub for fresh meats and groceries. The meat counter in the back draws a steady stream of customers, while the front serves prepared foods and sandwiches. 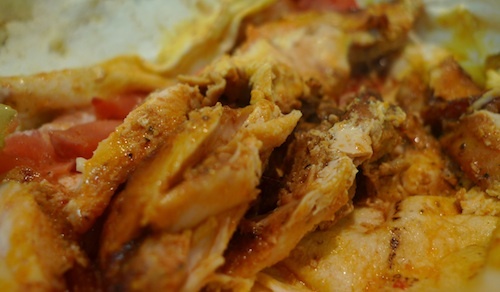 My first order at any Lebanese restaurant is the chicken schwarma ($4.50, below), almost always a delicious and very inexpensive item. The version here could stand a healthier dose of the buttery garlic sauce toumeh, while the pickles need a little more kick. That being said, the sandwich is definitely delicious good, and well worth the small rising price. The bread here is a bit thinner than usual and nicely toasted, adding a crispness to each bite. [As denoted by strikeout text, the standards are changing a bit, as is the price]. I wanted to try a few more of the items here, so I ordered a vegetable dish and something from the steam table. As has happened in the past, I was very disappointed by the roasted cauliflower, which is served cold and terribly limp. You can ask for this to be microwaved, but that only solves half of your problems. The steam table is not kept warm enough, so the okra and rice dish I gravitated towards was a bit tepid. This made the whole thing less enjoyable, despite its nice aromas and spices. The sparse chunks of beef are on the dry side, but the soft okra can be so nice with a scoop of the sauce and rice. I am not exactly sure how the pricing works for this, as nothing was weighed, but on the menu reading "Grilled per lb" is an array of items with the most expensive being $10.99/lb. The plate below was much cheaper than that. In other news, did you know that toumeh had its own website?